Is that your Z? IF so how did it fit? That elia wing is nice. Probably one of the nicer looking ones I've ever seen. Like it more than mine. 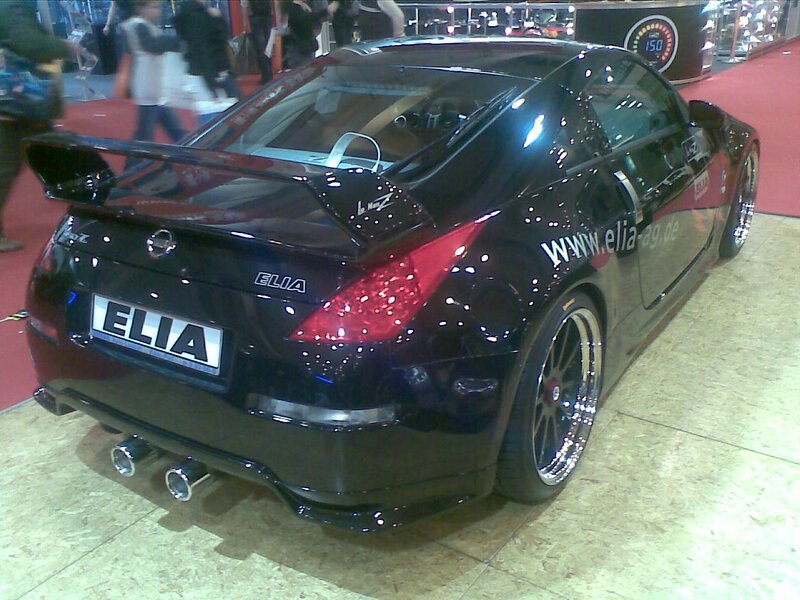 Wow, I love that Elia rear. I contacted them, I'll let you know if I hear anything back. he is the one who is in charge of export. Last edited by german_tuning; 02-17-2008 at 10:06 AM. yes it is really its exhaust! The wing costs 399,-- Euros without shipping. But i think they can make it a little cheaper. I will ask my friend, he is working at ELIA, how much shipping would be. Pictures you find on their Homepage, for example in the Galerie (Gallery). Just wanted to let everyone know that I did hear back from them, and they seem like a great shop! Very reasonable and quick to respond. They do speak english, so you don't have to worry too much about using a free online english to german translator like i did lol. I'm going to email them back later today. Are you referring to the rear diffuser? If so, I'd like to know if they make one for the stock single exhaust on each side. I also like Revolfe's diffuser but it's real expensive. 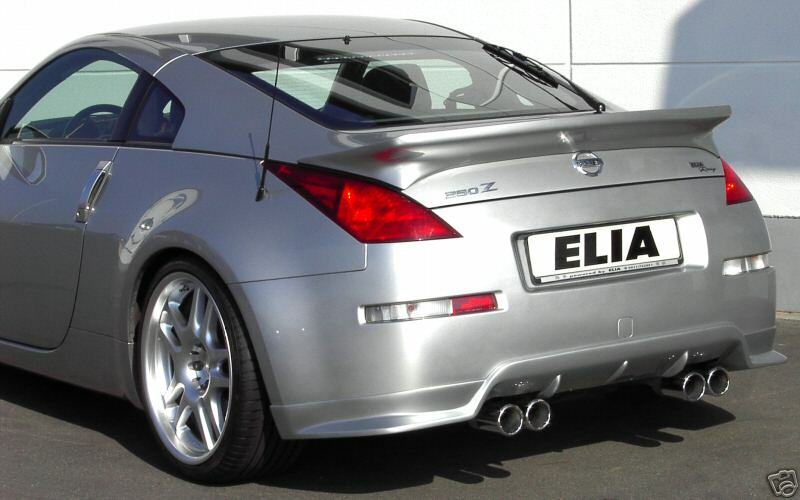 BTW aren't you selling your Z? yeah the rear diffuser. I think that it will fit, look at the attached pic. It has dual tips, but they are not center exit like in the pics above. 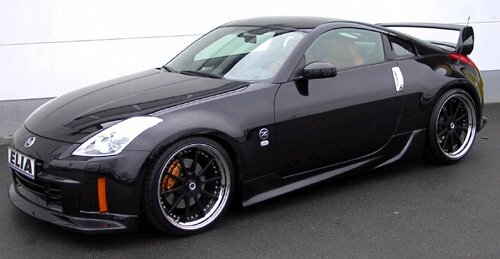 I am selling my car, but I am buying another Z.
Whoa...that is sharp!! I wonder about fitment issues & price shipped. For me personally it's got to fit like a glove & how is it attached. Please keep me posted & Thanks! It looks better than the Revolfe. Price shipped from Germany is very reasonable and competitively priced with other quality diffusers. Send an email to [email protected] and get your quote. He can speak english, so don't worry about that. Can't tell you about fitment issues as I have never seen one in person before! There is a member on the boards that lives in Germany, do a search for elia and you will find him. You could ask him about it since he used to have the kit in black. I like it a lot and will probably order it sometime in the near future, I don't want to at the moment though, since I'm a little strapped for cash buying the new car lol. i found another nice rear wing, also from ELIA. its called WRC-Style i think. Really? Where is it? Just kidding. I'm not sure what to do with mine. I'm either going to leave the stocker on it, shave it and have no spoiler, or put a G35 coupe spoiler on. Any more info on this wing anybody? I think that is the best looking tall/big wing spoiler I've ever seen. I like it because the sides of it don't run the whole length of the taillights like veilsides and the Nismo. A vendor needs to import these things. Man the more I look at it I REALLY like that wing. A LOT! I want one import it somebody. Last edited by Chad68; 02-18-2008 at 04:15 PM. Any more info on this wing anybody? PM the user that "found" the wing......look at his sig. I just emailed one of the guys in Germany about it. I so want this thing. Uh, how about my OEM Toyota Celica GT-S Spoiler...?